Indulge your patrons with the rich, creamy flavor of pumpkin pie filling blended into their coffees and specialty drinks with this Torani 16.5 oz. pumpkin pie flavoring sauce! Crafted with hints of cinnamon, nutmeg, and ginger, this flavorful sauce embodies the spirit of autumn and the warmth of holiday cheer. It is packaged in a user-friendly 16.5 oz. plastic squeeze bottle, making the sauce easy to dispense. We make a pumpkin pie ice cream for the holidays and this Torani pumpkin pie sauce is the perfect compliment to the ice cream. It has a great pumpkin pie flavor with out being too sweet. When customers start asking for Pumpkin flavored everything, this is the route to go! Pumpkin Pie milkshakes are super easy with this pumpkin pie flavoring sauce! We love pumpkin around here and that makes this a favorite! We use this on top of whipped cream in our pumpkin milkshakes for a little razzle dazzle. It can also be used to swirl the outside of the cup for a great decoration if you want a fancier presentation. I love the taste of this pumpkin pie flavoring sauce and it is down right delicious. The sauce is a great garnishing sauce and also makes for a great addition to our specialty coffee. Tastes really good. We haven't tried it on many things. We drizzle it on the whipped cream of our pumpkin lattes. And we use it as a dipping sauce for churros. It tastes so so good with churros. The Torani Pumpkin pie flavoring sauce is very delicious. The sauce is great for seasonal use and makes delicious tasting pumpkin pie milkshakes. Very pleased with the quality and feedback from customers. This flavoring syrup is perfect for topping the whipped cream on top of a pumpkin spice flavored hot drink or the pumpkin spice frappe. Easy to use. This pumpkin pie sauce will be your new favorite flavor once you try it! It spices up vanilla ice cream to perfection and works well on top of a pumpkin spice frappe too! The pumpkin pie sauce is a customer favorite during the fall time, this bottle is great size to use to drizzle the sauce on top of drinks. I love this pumpkin pie flavoring sauce. It is a customer favorite in our coffee and ice cream shops. All of our customers always ask where I get it from. An extremely popular item in the fall this pumpkin sauce has an authentic taste and provides for a nice beverage for our pumpkin fans out there. This is the best pumpkin pie sauce for coffee. Too with come whip cream and pumpkin pie spice and it makes an even more delicious latte. This sauce is used for the seasonal fall drink that everyone loves. Its thick consistency is great for decorating dessert plates as well. It’s delicious! this is the bomb. it makes our pumpkin pie cupcakes taste like they are out of this world delish. It has a great consistency and pour evenly. Great new garnish for us at our cafe. Most people are order a pumkin spice drink. This is a great way to take it to the next level for your guests. I love this stuff so much! Torani is my go to product anymore just because of how real all of the flavors taste! This one is way better than I imagined! The flavor is wonderful, and it comes in an easy to use container so you can drizzle this delicious pumpkin pie flavor over anything! Tastes like pumpkin pie and lasts a very long time. The cost is competitive with stores that charge double. goes great in coffee and milkshakes. Love this pumpkin pie sauce, it tastes AMAZING! Seasonal flavors are a wonderful break from the ordinary, my customers love this stuff! Always looking forward to FALL FLAVORS! The pumpkin pie flavoring is awesome. It has just the right flavor and is a superb quality for the price. The container is efficient and stays free of clumps. Are you a fall pumpkin spice fan? Then pick up this pumpkin pie sauce and stir it into your coffee. Drizzle it on your ice cream. Pour it in your mouth. It's that good. Enjoy this autumn blend of ginger and spices making this pumpkin pie syrup perfect for your coffee and lattes. Enjoy the feel of the holidays with this flavoring sauce. The perfect touch to the perfect hot or iced pumpkin spiced coffee. I'm pleased with this sauce and use it to line clear plastic cups for pumpkin spice cold brew. It enhances the value proposition and improves the beverage. This is delicious in a pumpkin spice frappe. We love to drizzle sauces down the sides of the cup when we make frappes, and this is so good when paired with the torani white chocolate sauce. this is not my favorite of all the flavoring sauce i purchased but it's still a pretty decent flavor which taste a lot better than the syrup in my opinion. This sauce tastes like pumpkin pie liquefied and put into a bottle. It can help add that special touch, and nostalgia, to just about anything. Rich and delicious, this sauce is totally yummy and feels so decadent drizzled over whipped cream on your drink! Can't wait to use this in hot chocolate, coffee, eggnog, topping a pie, etc. It has a very naturally caramel-y pumpkin-y taste and is totally a winner in the sauce department! This pumpkin pie sauce is great. So much more flavor than most other brands. We use another brand for our syrups but are glad we came across this sauce. Pretty flavorful. Just add a little to coffee and it will taste like the pumpkin spice coffees you get from coffee shop stores. Will buy again. Great Torani flavoring sauce. As fall approaches the Pumpkin Pie flavoring is one that customers love. Wonderful taste in your coffee or favorite desert. Nice price. I tried syrups in the past and was never pleased but this one tastes so good and best of all the ingredients are all natural! 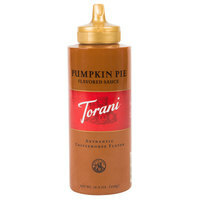 The Torani Pumpkin Pie Flavoring Sauce is a great way to make pumpkin spice coffee and lattes. The container's small size makes it great for easy pouring. The flavor is amazing! This Torani caramel sauce is excellent! It has a really rich flavor, unlike other grocery store brands. Definitely recommend it for home or small business! I use this in the Autumn because it is such a classic fall flavor. It can be used in coffee of course, and also as a topping for ice-cream or to decorate the plate for pumpkin pie with whipped cream. Torani's flavoring sauces are amazing: great quality, perfect consistency, and delicious taste. This pumpkin pie flavor fits the bill perfectly. It makes the perfect pumpkin spice latte. This Torani Pumpkin pie flavoring sauce is excellent. It delivers a great taste and it works very well for adding that special flavor/ We recommend this for sure. This is just ok. I ordered it back in October and just recently opened it to add it to my coffee. It didn't go with it. The sauce is runny and the more I squeezed into my coffee, I felt bad for adding so much of it! I would only recommend this sauce for ice cream or maybe squirt some into yogurt or cottage cheese. This Torani Pumpkin Pie Flavoring Sauce is by far the best pumpkin flavor I've tried! Each Fall, pumpkin spice concoctions fill grocery stores and coffee houses and I wanted to replicate some of these favorite treats at home. I originally purchased this item to flavor my cappuccinos, but I've also used this drizzled over ice cream, zucchini bread, and even to add sweetness to yogurt and fruit. It has a great pumpkin taste with hints of spices like nutmeg and cinnamon. I can't wait to try the other flavors of Torani sauces. This has been a really good sauce. Just opening it up, it smells like Fall. I go through this flavor quite a bit during the fall season. This flavoring sauce is fantastic! Our company loves it in our coffee drinks and even on top of our desserts! It smells like fall and you can really taste the pumpkin! With Fall upon us and the seasonal flavors that come with the season begin to pop up, we wanted to be ahead of the curve and get the Pumpkin Pie Flavoring Sauce for our items, whether for a drizzle or full-out coverage. We bought some at the end of last year and our customers loved them, so we are back to buy more! Awesome flavor for the seasons of thanks giving u feel the holidays flavors for this pumpkin pie torani sauce great flavor adding to my coffee !!! We love the pumpkin pie flavoring. It helps us add just a bit of uniqueness to several of our desserts. We will be ordering this product over and over. This Torani pumpkin pie sauce makes my families' lattes wonderful. I have tried the syrups and they are not half as good. This is the best pumpkin pie sauce on the market. Taste just like Starbucks! !